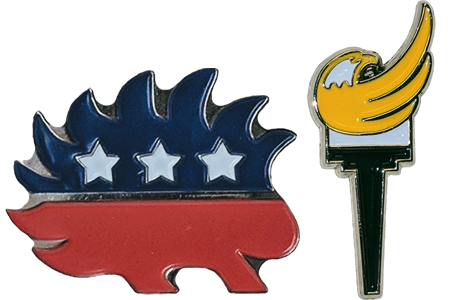 Get Your LP Lapel Pin Today! Price includes shipping. Allow up to 2 weeks for delivery. Thank you! Contributions to the Libertarian Party of Georgia are not deductible as charitable contributions for state or federal income tax purposes. State law requires political committees to report the name, mailing address, occupation and employer of any person making a contribution of $101.00 or more in an election cycle. Individual contributions not exceeding federal limits may be deposited in the Libertarian Party of Georgia federal account. Corporate contributions will be deposited in the Libertarian Party of Georgia non-federal state account. Contributions to the Libertarian Party of Georgia federal account are limited to $10,000 per individual and $5,000 per multi-candidate PAC per calendar year and are non-refundable. Contributions from foreign nationals are prohibited. A copy of our report is available from the Georgia Campaign Finance Commission in Atlanta, Georgia.